While preparing your own tax return may sound like a good way to save money, it often ends up costing you in the long run. An amateur tax preparer can miss valuable credits and money-saving deductions that could reduce your annual tax bill or provide a significant return. While tax software offers some assistance, there’s no substitute for the real world experience of a qualified professional when it comes to tax preparation. At The Neal Group, LLC, we keep up with changes in the tax laws and are always looking for new ways to help our clients keep more money in their hands, instead of sending it to the IRS. Whether you own a small business or are an individual, we have the skills to prepare your taxes in compliance with all Federal and State tax laws. We offer prompt, efficient preparation of all types of returns including corporate tax filings, multi-state taxes and individual income tax returns. Call us at 414-325-2040 today or request a complimentary consultation online to learn more about our Milwaukee, WI tax preparation services. We prepare tax returns for all types of businesses including sole proprietors, partnerships, limited liability companies and corporations. We can also handle multi-state taxes for businesses with locations in more than one state. Our income tax return services for individuals include quick turnaround so you can get your money back fast. We’ll make sure you benefit from all the credits and deductions available so more money stays in your pocket. In addition to traditional tax preparation, we’re qualified to prepare trust, gift and estate tax returns. We meticulously prepare these types of returns and file them on time to avoid penalties. 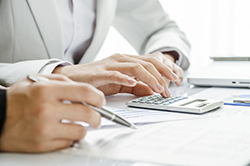 U.S. citizens working across the border or overseas have complex tax reporting needs. We’re proficient in international tax law and can prepare these types of tax returns and file them electronically.